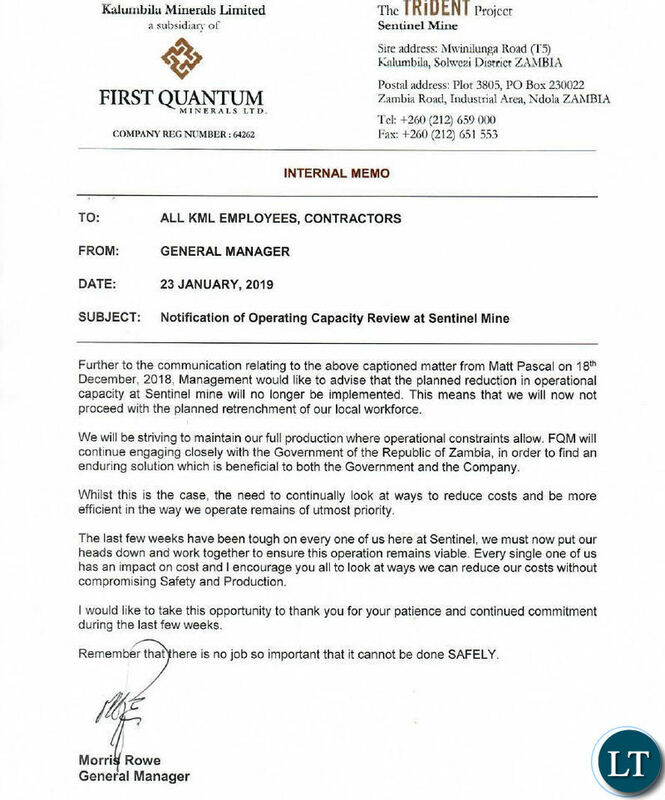 First Quantum Minerals has written to its workers reassuring them that the planned job cuts will not be implemented. In an internal memo, FQM General Morris Lowe said the company will continue engaging closely with the Zambian Government in order to find an enduring solution beneficial to both the company and the Zambian Government. I’m sure you are disappointed with this development. I’m puzzled and annoyed that a Zambian can wish his fellow citizens misfortune. Just enjoy your stay in a foreign land. THis is a game of Boardroom Chess..you need to savvy to see what is happening here!! Ndobo and that other Spaka are traitors of the worst kind. They never want to see other Zambians do well. They actually might be HH’s children or relatives. Zambia is winning, and these people don’t like it. 1.4 Ndanje Khakis I am equally puzzled. It is clear that somebody has given in something to their demand. Time will tell very soon. These mines don’t just back down. The gorvenment should advertise for new partners on a 51-49 % share holding as the lasting solution to any form of threats by these mines. The copper ore in the ground is a God given resource to the people of Zambia and not foreign exploiters. The recent threats of job cuts for tax reasons is essentialy an act of economic sabotage and government should do the correct thing which is 51% share holding .take it or leave it. That was the set until 1984 when government decided to get all the shares. Unfortunately the then new government instead of reverting to this system sold everything. ..maybe in the hope that the IMF or the World Bank would do us special favours. This is not good report for hh and his stooges. Their wish is to see to it that zambians suffer so that they can revolt against pf govt and give them a chance to be voted in govt. They know that naturally they cant win public confidence. Now with the way things are unfolding 2019 looks so bright and exchange rate will drop meaning fuel price will come down. This is good news, now they should pay the taxes…. ” To all Employees, Contractors”… There is a different scenario happening at Chambishi Metals Plc . Most of contractors were terminated and planning to mitigate 8 remaining without the media houses not knowing. contractors were terminated not 15 days with notice but 13 hours of notice which is a sad situation. So which mines were talking to the privatisation crook who has hidden the privatisation loot in the paradise papers and are waiting for him to win in 2021… or was he just hallucinating during that Christian voice radio interview as usual. In a normal Government environment, it is really futile to fight against the state. Now the mines have started doing the right thing. VIVA the Government of the Republic of Zambia. Shame the devil who is always wishing bad about the Government. When the same FQM was threatening job cuts, Hakainde was busy cheering them on. So what is his position now? He is always siding with mining companies’ arm twisting tactics!! That’s why I will NEVER vote for that moron in my life time. January 2015 elections Edgar Lungu wins the presidential by election and the mines retrench thousands of miners. Was that a mere coincidence? Very good govt .we hear whites were not allowed to renew there work permits hence they dropped there guard.